This comforting pasta dish is very delicious,flavorful and satisfying.This dish can be vegetarian using mushrooms instead of meat or ground beef,chicken or turkey for meat lovers.If you’ll be using chicken broth,I highly recommend to make it from scratch.In my opinion it’s really more flavorful then store bought. 16ozs. spaghetti cooked al dente and drained. In a large skillet or saute pan heat 3 tablespoons of olive oil. Throw in mushrooms* and continue to cook until all liquid is absorbed. In a another skillet; heat olive oil and throw in onion,green onion and bell pepper. Saute until vegetables are soft. Using a hand blender or food processor,pulse mushrooms with cream until nice and smooth. Transfer back to the pan. Add broth,sour cream,both cheeses and sautéed vegetables. Season with salt,pepper,cumin,and red pepper flakes. Mix the sauce with spaghetti and transfer to a casserole dish. Sprinkle some cheddar cheese on top and return to oven for another 3-5 minutes. The flavors sounds perfect together! I would so love to try it soon. 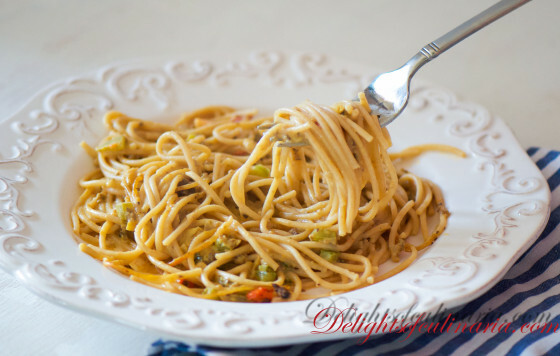 They really are…something different from Italian style pasta dishes.try it out and let me know how was it!